Why is Liberty Utilities pushing its gas on Lebanon? | No Pipeline Here! Liberty Utilities has plans to build a fracked gas distribution system in Lebanon and Hanover, starting with construction of a depot in Lebanon to store compressed natural gas (CNG) delivered by truck. They plan to later expand the depot to include multiple 60,000 gallon tanks holding liquefied natural gas (LNG). Why does Liberty persist in pushing their project when it has virtually no community support? The answer to that question may lie in the regional context of aggressive expansion by the gas industry. That expansion is being driven by international energy conglomerates, and it has little to do with the “public interest” that regulated public utilities are supposed to serve. The Canadian company that owns Liberty Utilities has been a partner in a project to construct a major interstate pipeline to deliver fracked gas from Pennsylvania to Massachusetts. The developers of that pipeline have argued that New England needs greater gas pipeline capacity to cover the region’s energy needs during the coldest weather. 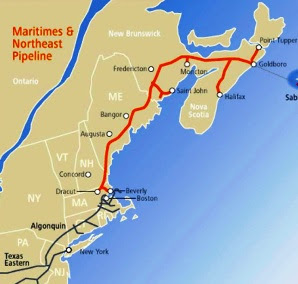 However, the developers have sought and been granted approval to send that gas on an existing pipeline to terminals in the Canadian Maritimes, from where it will be exported overseas. To win approval of federal regulators for the new infrastructure, the developers are required to justify the project based on “need”, which has traditionally been demonstrated by signed contracts with local gas utilities. That’s where Liberty Utilities comes in, by signing a contract to buy gas from a pipeline in which its parent company has a financial interest. Liberty and its parent can’t lose because the captive rate payers bear the risk of the gas utility’s investments. Liberty Utilities is owned by Algonquin Power and Utilities Corp (APUC), one of Kinder Morgan’s partners in the Northeast Energy Direct (NED) pipeline project. The NED pipeline was conceived to run through upstate New York, Massachusetts and New Hampshire, ending at the gas hub in Dracut, MA. NED, along with Enbridge’s Access Northeast pipeline, was intended to supply fracked gas from Pennsylvania to the Canadian Martitimes for export overseas on LNG tankers. To justify approval by the Federal Energy Regulatory Commission (FERC), the projects needed to produce contracts from customers for the gas. Liberty Utilities, in its capacity as a local gas company, signed an agreement to buy gas from NED. In October 2015, the NH Public Utilities Commission approved the agreement. Notably, the PUC’s order approving the agreement contained a “growth incentive”, which imposed penalties on the company if it failed to expand its gas sales substantially each year. Kinder Morgan withdrew NED in 2016 due to lack of sufficient contracts. Enbridge suspended Access Northeast in 2017 for the same reason. That’s not the end of the story by any means, though. Two separate LNG export terminal projects are moving forward in Nova Scotia. If bu ilt, these terminals would liquefy fracked gas from Pennsylvania and export it to overseas destinations. 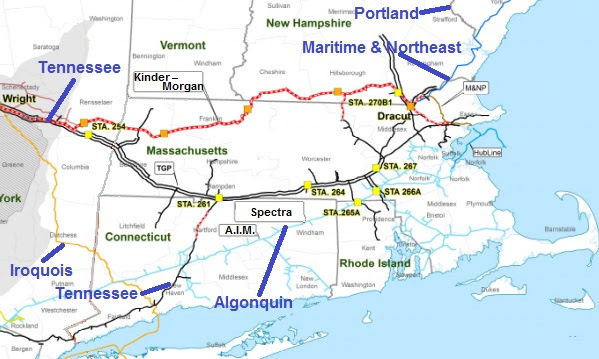 Gas is already being sent north from the hub in Dracut on the Maritime and Northeast Pipeline that until recently carried gas only south from Canada. The export projects were conceived back when NED and Access Northeast were still on the table. Now, the Trump administration’s commitment to unbridled fossil fuel development may prove to be a game changer for speculative projects like those. Interstate pipeline developers, such as giants Kinder Morgan and Enbridge, and Liberty Utilities’ parent APUC, are required to demonstrate a “need” for new gas infrastructure before a project can gain approval from the FERC. The justification for additional capacity has traditionally been provided by long-term contracts with local gas utilities. However, Liberty Utilities has been part of a troubling new trend, where gas utilities that have become subsidiaries of pipeline companies sign contracts to buy gas from a pipeline that their parent company has invested in. State-regulated utilities are legally guaranteed a profit on investments they make to provide service to their customers. They will realize the profit even if the investment ultimately proves to be a poor bet. When the contracts used to demonstrate the need for infrastructure expansion are between a pipeline developer and gas utilities that it owns, then there’s reason to think that benefits of the transaction will be transferred away from the utilities’ captive rate payers to the developer, while the financial risks are offloaded in the other direction. In that case, the developer and the utility have a mutual financial interest that may well be against the interests of rate payers and the public as a whole. That mutual financial interest may also provide an incentive for the subsidiary utility to sign up for more pipeline capacity than its customers need. Just that sort of too-cozy relationship came about between Liberty Utilities and its parent APUC with the NED pipeline, before the project was ultimately withdrawn for lack of sufficient customers. NED is gone, but the gas industryhas not given up its plans to build major new pipelines into New England from the Marcellus region of Pennsylvania. If enough expansion plans being pushed by local gas utilities are approved by state regulators, we can expect Kinder Morgan and Enbridge to come back with new plans for bigger pipelines.